Organizers of the 2014 Winter Olympics in Sochi, Russia are worried about the snowfall next year. The resorts are new and the weather stations are new. There isn’t a lot of recorded weather history. However, the weather in February has been in the 50’s the last 3 years and rain has been a problem in the lower elevations. Organizers decided to take steps now, to ensure they will have snow for the games. They put together what they call the biggest snowmaking operation in Europe. They have over 400 snowmakers spitting out man-made snow right now. The idea is to stockpile 500,000 cubic meters of snow in shady areas above the venues. The piles will be covered with insulated blankets to protect the snow from the summer heat. Next year, snow groomers can push the piles of snow to where it is needed. Even if it doesn’t snow at all next year, the stockpiled snow will be enough to make the games a success. 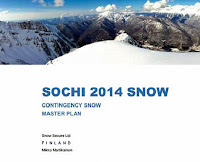 A Finnish company called Snow Secure developed the snow strategy being followed by the Sochi organizers. 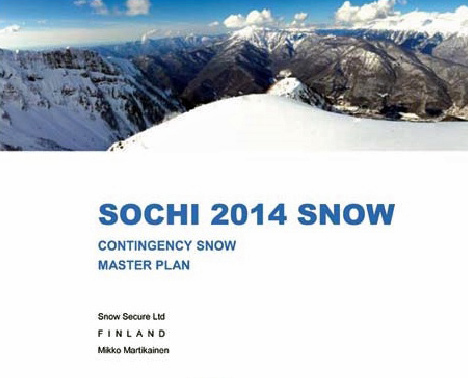 Snow Secure comes up with strategic plans for protecting and prolonging ski seasons.